In a 2008 ESPN poll, Boston ranked 5th among viewers as “Title Town, USA.” By 2011, various publications were declaring Boston to be Title Town. “From 2000 to 2010, the Patriots, Red Sox, Celtics and Bruins would combine to win seven championships in nine appearances—an unprecedented feat. (Bleacher Report, 2011)” I’m no sports expert but that sounds damn impressive. Owning titles inspires pride. It’s excuse to toot one’s horn (ska pun very much intended). These accolades make Boston a reference point. What’s all this got to do with music? Boston has always been known as the home of a particular variety of sounds. E Online of all places made it a point to mention “ska/punk” in a 2015 Super Bowl article. Fake news site The Hard Times sets their stories in the greater Boston area. While New York gave birth to Moon Ska and The Toasters, and Orange County spawned a 90s beach bubble, something special and unique was happening in Boston. A two-day ska festival at the Middle East in April seeks to channel this pride. 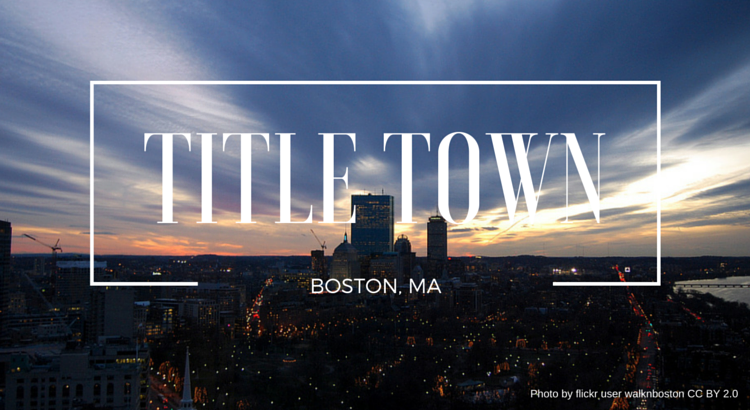 By naming the event “Title Town,” this series knows that Boston is a home for some signature ska sounds. This festival will celebrate the scene and sounds for which Boston is known. Big D & The Kids Table vocalist David McWane talks about strength in numbers. Having a strong scene is what makes those overly glorified “taste makers” look your way. Only together can you make it. Only together can you make them notice you. Think of the music industry as a monster. If you want to attack the monster, best do it with as many friends as you can rally. We’re happy to support any show or scene that seeks to build unity. We’ve always thought Boston’s scene was worth rallying for. This affair will take place at the intimate Middle East Upstairs. Local favorites Westbound Train, Have Nots, Nick and the Adversaries, Big D, Doped Up Dollies, and The Pomps will be joined by The Far East and Counterpunch from New York and Chicago, respectively. Jacob Wake Up! is managing editor of Boston Ska (dot) net. He's been going to ska shows since high school and never looked back. Jake lives in Roslindale and works in communications by day. You can see him perform with The New Limits or strike up conversation with him at a local ska show.